The Root Of All Evil Radio show is a hard hitting weekly metal show founded and forged by our metal brother Earl Root (R.I.P.) in the spring of 1987. It is (as far as we know) the longest running Independent Metal radio show in the world and it just keeps getting better and better after 27 years of continuous head banging and horn throwing. Bringing you every genre of metal, from the hardest and most brutal metal ever conceived to the softest and gentlest and everything in between — and always room for our awesome local Minnesota metal scene! Produced and creatively shaped by an orchestra of dedicated metal loving people known (in this world) as Mara the Death, Dr. Beast, BloodJohn, Verminator, and The Sheckanator. They will never stop pouring out the metal so you better keep drinking it, or they will come find you, and you don’t want that. Muhahaha. 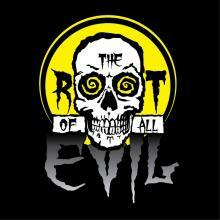 Connect with us on Facebook for news, contests, and behind-the-scenes videos at www.facebook.com/rootofallevilKFAI.